Choosing one of the best instant tents for camping might just be the secret ingredient to make your next camping trip a resounding success. Read on to find out how to choose the best family instant tent and check out our reviews of the best instant tents for camping this year. Is an Instant Tent the Same as a Pop Up Tent? 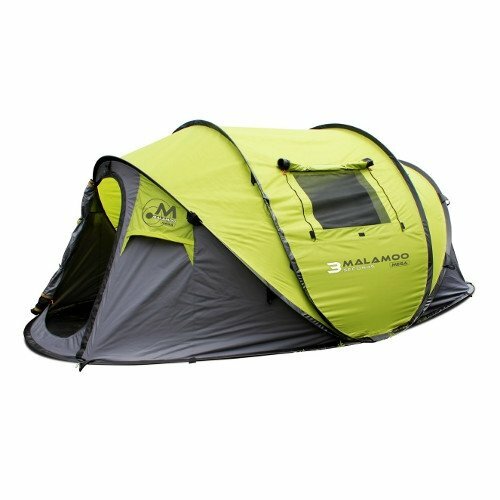 What is the Best Brand of Instant Tent? Review: For a truly care-free camp set up, this tent takes a ridiculous 30 seconds to whip into place making it ideal for small families with small children. Takes just 30 seconds to set up. Comfortably sleeps 4 people or a large queen mattress. Core H20 Block Technology for waterproofing. Some issues with the door zipper getting stuck in the rain flap. 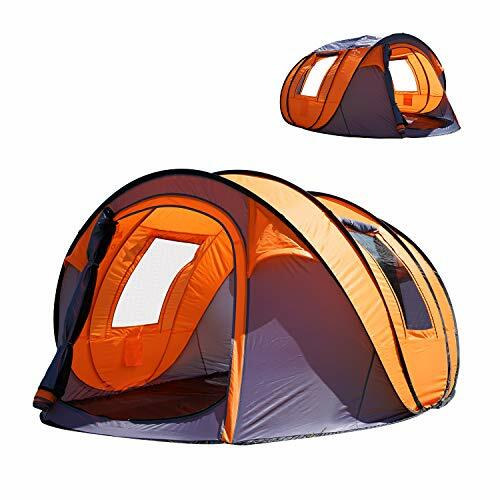 This is a compact and convenient instant tent and the best instant tent 2019 for small families. Review: If you like a few extra hours of shut-eye on your summer camping trips, this is the tent for you. This cabin style tent uses Dark Rest technology which blocks out the light keeping the interior dark once the sun come up. Multiple skylights with Dark Rest Panels allow for customized lighting. Stands up well to wind and rain. May get a little stuffy inside with all the windows closed. 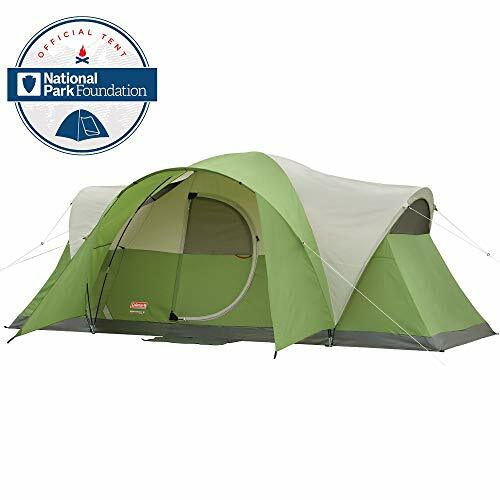 This tent is a winner, being excellent value for money and a sturdy shelter while also being instant. 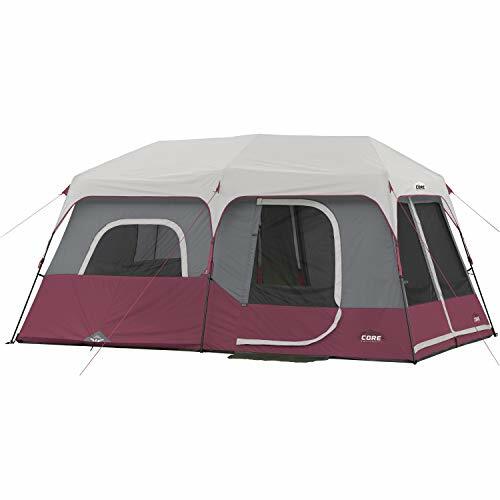 It is probably the best instant tent 2019 for families of 4.
Review: This is a large cabin style tent with an instant set up making it another great choice for families. Unfortunately, the built-in rainfly isn’t really adequate and an additional rain fly is sold separately, but aside from this, there’s not much to fault. Sets up in 60 seconds. Spacious interior with plenty of standing room. Comes in 4, 6 or 10 person sizes. May require seam sealing for optimum waterproofing. The integrated rain fly is not weather proof in heavy rain. 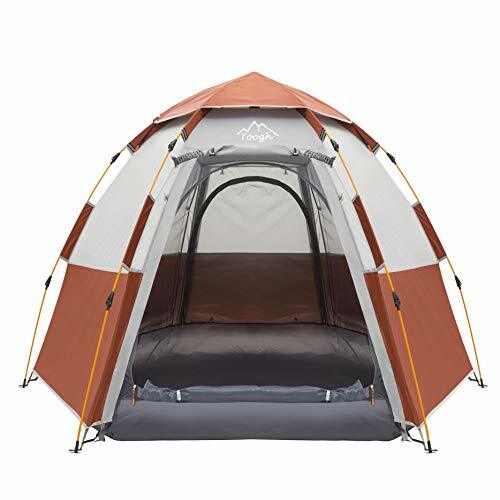 This is hands down the best family instant tent if you don’t mind buying the rainfly separately. The 10 person version is the best 10 person instant tent. 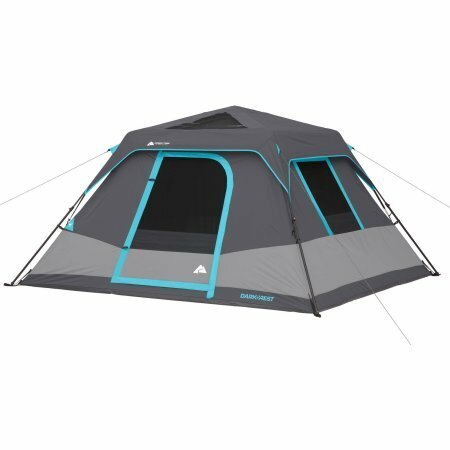 Review: This is as big as it gets in the instant tent world, so this is the tent you’ll want for large groups of up to 11 people. Huge 14’ x 14’ dimensions. Easy, smooth set up in 2 minutes. Room dividers create 3 private areas. Large mesh windows provide plenty of ventilation. Doesn’t have a bathtub floor. This is an excellent option for large groups looking for an easy set up and the best large instant tent. Review: This large 13’ x 7’ cabin tent is ideal for families, being equipped with so many extra features you’ll be hard pressed to find fault with it. Sets up in 8 minutes. Comes with a built-in closet and LED lighting. May not be the best suited tent for windy conditions. This is the best instant tent for large family groups and the best 8 person instant tent. 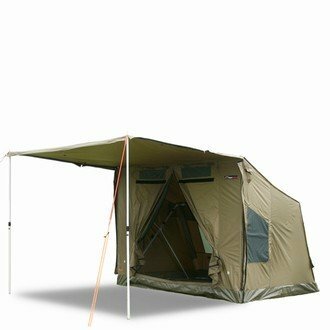 Review: Another excellent cabin style tent with impressively easy set up for such a large tent. It can even double as a stargazing tent due its huge mesh windows and mesh ceiling. Core H2O Block Technology and excellent ventilation. Adjustable rain fly stays taut and copes well with the weather. Room divider provides 2 living areas. No awning means rain can get inside when you enter and exit the tent. There’s little to fault this tent when it comes to quality. 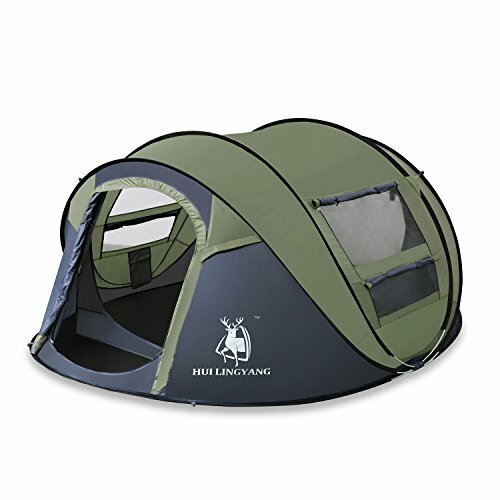 It’s definitely one of the best family instant tents and the best waterproof instant tent. Review: This is an instant tent from a lesser known brand but which still deserves a place on this list for its genius umbrella style set up and durable materials. Bathtub floor and 2000mm rated PU coated polyester fabric. Has an integrated vestibule for gear storage. No-see-um mesh is effective at keeping out insects. Single wall design will attract a little condensation in wet weather. 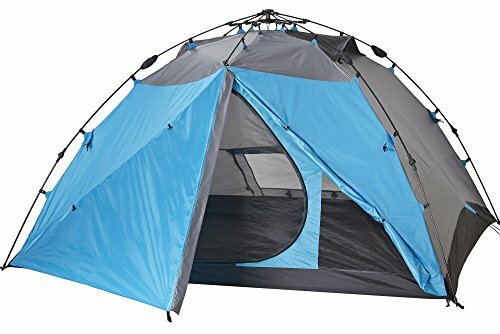 An excellent instant tent for a couple or three people. Review: If you’re looking for a heavy duty instant tent that will last a lifetime, this 4 man deal is your tent. Made of seriously tough ripstop polyester and cotton canvas, it will cope with a lot. 30 seconds to erect by one person. Heat-sealed PVC groundsheet and durable canvas outer is very weather-proof. Comes with a large awning. Canvas tents are expensive, but you get what you pay for – the quality won’t let you down. Review: This isn’t strictly speaking an instant tent, but it has been designed with easy set up in mind with continuous pole sleeves. The whole setup should take less than 15 minutes for one person, which is still impressive given its size. Sleeps 8 people but is ideal for family of 4 or 5 with a decent living area in the middle. Extended awning over the entrance way prevents rain from getting in at the same time as you. Windows are designed so that they can be kept open when it rains for ventilation. Not strictly instant set up. If you don’t mind spending a few extra minutes putting this tent up, you’ll be rewarded with a sturdy, well-designed and weather-proof holiday home. Review: This is as instant as it gets in the tent world. You do have to accept some compromises with a truly pop up tent, but this tent is surprisingly durable and weather-proof. Incredibly fast 10 second set up. Copes well with the weather. Uses some chemicals for flame retardant purposes which are not very safe for humans. If you’re determined to get a pop up tent and you need something that will stand up to a little weather, this is a good option. Review: This is an excellent quality 3-4 person tent that is easy to set up and reliable in variable weather conditions. 60 seconds to put up and take down. Silicon coated 210D Oxford fabric is durable and waterproof. 5’5” ceiling height is just tall enough to stand (for shorter people). 2 entrances are very convenient. Probably more suited to 3 people with stuff than 4. This tent ticks all the boxes for an easy setup, small family camping tent. Review: This is just about the only true pop up tent on the market that truly rivals conventional set ups in durability and weather-proofing. 3 seconds to pop up. Waterproof, built in rain fly. Includes vestibule which is less common in pop up tents. You’ll likely experience a bit of condensation when it rains, but this is almost unavoidable with single walled tents. If you want the convenience of a pop up tent but the quality of a conventional tent, this is the one for you. 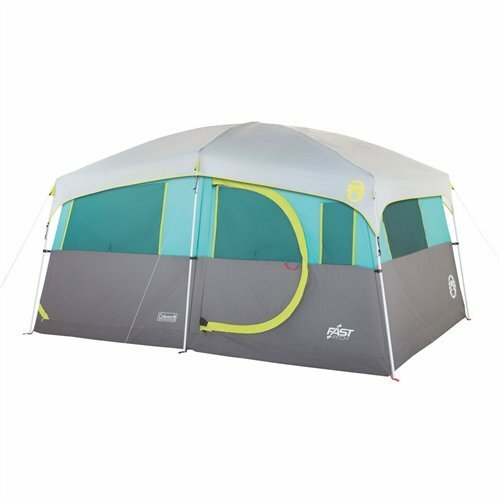 Review: This is another excellent pop up option that takes seconds to erect but leaves you feeling secure and protected from the elements. Made of durable PU coated polyester for waterproofing. Not designed for heavy rain. The windows open from the outside which doesn’t make much sense. 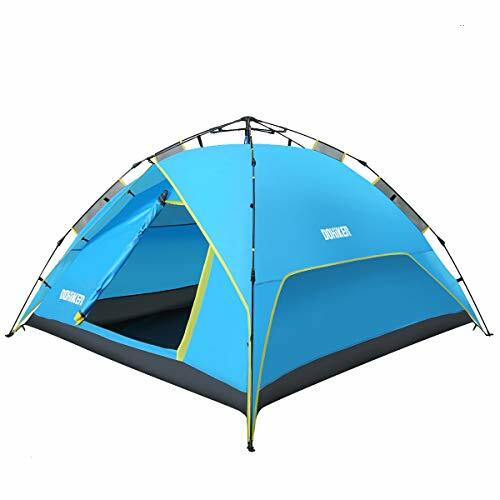 This is a great mid-range pop up tent option that is a very comfortable size for 3.
Review: This is another 4 person pop up tent worth considering for small groups on fair weather camping trip. Spacious interior is very comfortable for sitting. Pops up in seconds as soon as it’s untied. Comes with PU taped seams for weatherproofing. Large mesh windows and roof for sky view. Not likely to cope with high winds and rain (it’s water resistant but not waterproof). 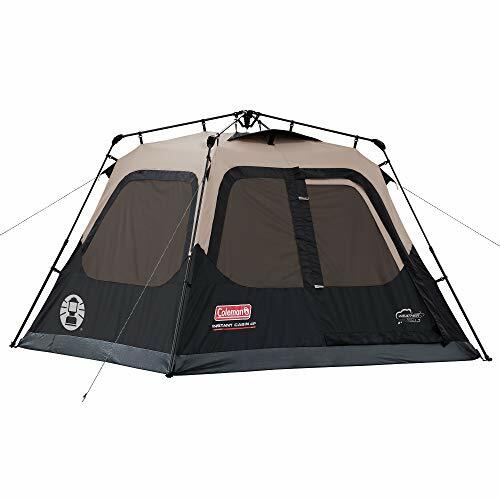 Provided you don’t expect it to stand up in a storm, this tent will likely exceed your expectation for a pop up tent in its price range. Review: This pop up tent is designed with UV protection in mind but there’s no reason why it can’t be used for a fair weather camping trip. Big enough for 2 adults and 2 kids. Extremely easy to use despite its budget price. Could double as a play area for kids inside the house or garden. 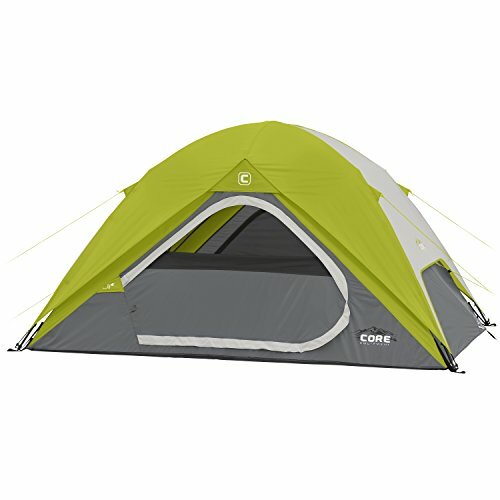 This tent is excellent value for money considering its low price point. So, to begin with, what exactly is an instant tent? Many tents listed as “instant” in some articles are actually no different from a conventional tent, taking anywhere upwards of 10 minutes to set up. This isn’t instant, is it? 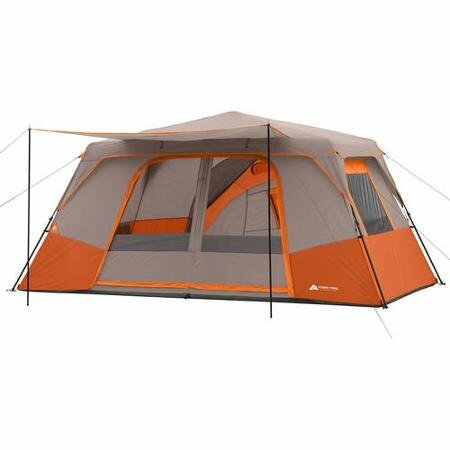 An instant tent should take no more than a minute to erect and require no assembling of poles. An instant tent, is a tent where the poles come already connected to the tent body, and are folded in a way that allows them to snap easily into place as the tent is erected, without you needing to know which one goes where. Some instant tents are even classified as pop up tents which means they literally pop up as soon as you unleash them into the air. Note: all pop up tents are instant tents, but not all instant tents are pop up tents. So, what should you look for when choosing the best family instant tent? There are a few important things to consider. Dome style tents are typically smaller and better suited to families that don’t have heaps of stuff, or smaller units of 3 or 4 people. They are usually more affordable and will cope better with wind than a cabin tent. Cabin tents can be absolutely massive. So if you tend to take a lot of stuff with you or you’re a group of 4 or more, a cabin tent is the way to go. Cabin tents also allow you to stand up inside while most dome tents won’t be tall enough for you to do that. The vast majority of instant tents are single-walled which poses some interesting problems that most people don’t think about. Single-walled designs are usually kept for heavy duty winter tents in the conventional tent world because they don’t tend to cope well with condensation. If you’re in a single-walled instant tent and it rains or the temperature drops significantly overnight, you’ll need to do your very best to maximize ventilation or you’ll have your family members’ breath dripping on you in the form of condensation by morning. 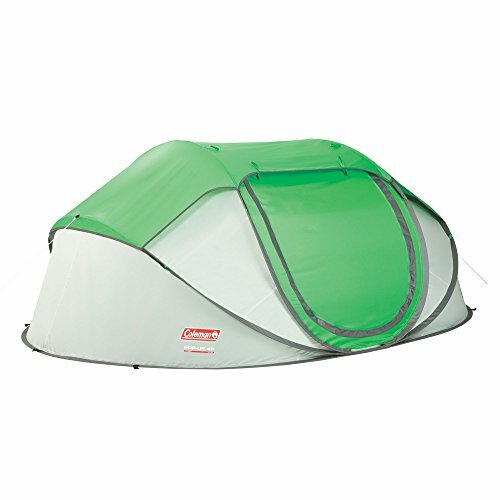 In saying this, some instant tents do come with a separate rain fly or allow you to purchase one separately. On the same note, instant tents don’t tend to be as waterproof as conventional tents. If you can’t buy a rain fly for the tent you want, at the very least make sure you seal the seams before you go camping in the rain. Regardless, some pop up tents just aren’t designed for the rain and you probably shouldn’t be wasting your money on anything that isn’t designed to be durable and provide you with multiple seasons of use. The hinges of some instant tents can lead to weak points which in the worst case scenario could result in the tent collapsing in on itself. Making sure the tent you purchase comes with plenty of guy line attachments (and the ropes themselves are useful too! ), will help to keep your tent stable and safe in the wind. This is also pretty important, unless you don’t mind your poles snapping in the wind and your tent landing in your face. Look for well-made, strong poles with sturdy hinges (if there are hinges). This depends on the size of your car, how far you’ll have to carry the tent from the car to your campsite, and how much other gear you’ll be bringing. Instant tents aren’t compatible with backpacking. Instant tents don’t tend to pack down as small as conventional tents so be aware of this when browsing the options. Pop up tents often pack flat, but wide. An instant tent is usually a tent where the pole structure comes already attached to the tent body so all you have to do it open it up. No. Pop up tents literally spring themselves into shape as soon as they’re removed from their restraints. Instant tents require some lifting into position. Pop up tents tend to be lower quality than instant tents in terms of their ability to cope with weather and their long term durability. Many of the best camping tent brands offer instant tent options but the most popular instant tent brands on the market are currently Coleman and Core. The good quality ones are, yes. But as with everything, you get what you pay for. The cheaper instant tents will almost certainly not be waterproof, or if they are to begin with, they won’t stay that way. If after reading all this, instant tents aren’t quite cutting it for you but you don’t love the conventional pole style tents, why not try inflatable tents? Check out our article on the best inflatable tents for more info. So there you have it, a rundown on the best instant tents for camping and how to choose the one most suited to your needs. Instant tents are one of those things that you either love or hate, so don’t be afraid to share your thoughts and comment below! Oh, and download our free travel ebook too!